The bridge on the Circle Trail at the Falls has been successfully replaced and the trail has been reopened. 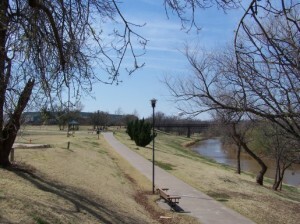 Wichita Falls has a trail system that rivals that of much larger metropolitan areas. It presently consists of over 18 miles of concrete trail. The first concrete trail was built in Lucy Park in 1987. Since that time there have been another 14 miles of concrete trails constructed primarily along the Wichita River and along Holliday Creek. Two new sections of trail opened in 2012 -- a 1.7 mile segment along Barnett Road from the Johnson Road intersection to Lake Road, and a 1.8 mile segment along Seymour Highway from the BNSF railroad to the new Wichita Bluff Nature Area. The new Wichita Bluff Trail opened in 2017 and runs thru the Wichita Bluff Nature Area to Loop 11. Three additional connector trails are planned that will complete the "circle." The resulting city-wide Circle Trail will be approximately 24 miles. Funding has been obtained for two of these trails and construction is slated to start in 2018. Almost all of the trails are 10 foot wide reinforced concrete. They can be used for walking, jogging, bicycling, and roller blading. Nothing motorized is allowed except for official city vehicles.